An exceptional vintage for Grenache. Châteauneuf du Pape, between Orange and Avignon. Château de Beaucastel Red is a 70-hectare vineyard. Great nose of ripe red fruit, truffles, under-wood, cigar box and wet soil. The mouth is harmonious, silky, round and the tannins are soft and sweet. A great wine that can be drunk now. Imported by Vineyard Brands. 13.6 % Alcohol. This wine revealed the Beaucastel funk on the nose with higher toned, mature aromas. In the mouth were earthy to funky fruit flavors that bore thin, higher-pitched, cool red fruit. With air the wine picked up good complexity, cleaned up some, and took on weight. It showed that there was still fruit and even tannins. *** Now-2020. I have had the 1985 from regular format as well as magnum, with few differences noted. The color remains a healthy dark ruby with pink and amber at the edge. Always fragrant, it offers up sweet, jammzsy, peppery, herb-tinged black cherry, leather, and grilled meat aromas. 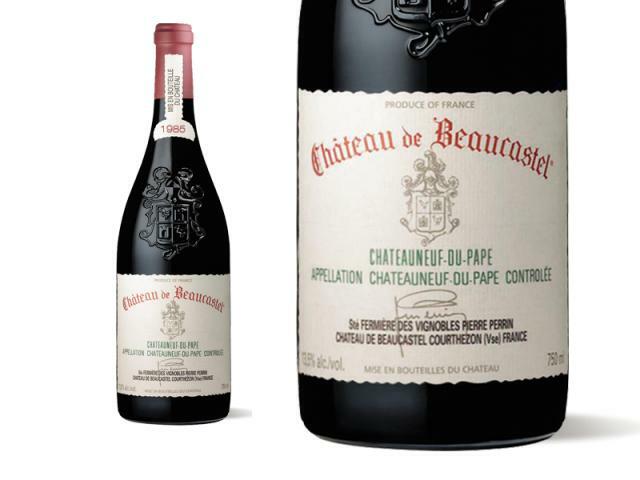 Soft and medium to full-bodied, with low acidity and sweet tannin, this plush, round, graceful, fully mature Beaucastel is best consumed over the next 4-5 years. A seductive wine, with lush flavors. Wonderfully deep ruby in color, with rosemary, tomato and earth aromas, full-bodied, focused raspberry and chocolate flavors, silky tannins and a long finish.--Châteauneuf-du-Pape retrospective. Best after 1994. Robe très sombre à reflets noirs. Arômes de fruits très cuits, avec des épices. Un vin surmûri, très flatteur et agréable à boire en l'état. Il serait cependant dommage de ne pas l'attendre : il gagnera en complexité.